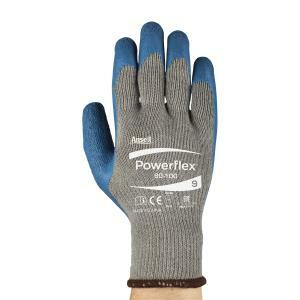 The Ansell PowerFlex® 80-100 glove is designed for use in a wide range of handling and carrying applications. It stands up to wear and cuts and offers plenty of comfort. For optimum productivity and safety in construction, transport, and shipping and receiving, the PowerFlex® 80-100 glove is the smart and logical choice. Thanks to its natural rubber coating, the Ansell PowerFlex® 80-100 glove delivers excellent overall mechanical performance for maximal protection and durability. The latex coating’s raised crinkle finish gives the glove an excellent grip in both dry and wet conditions. The automatic knitted liner delivers an optimally tensioned inner surface for superb fit and flexibility.